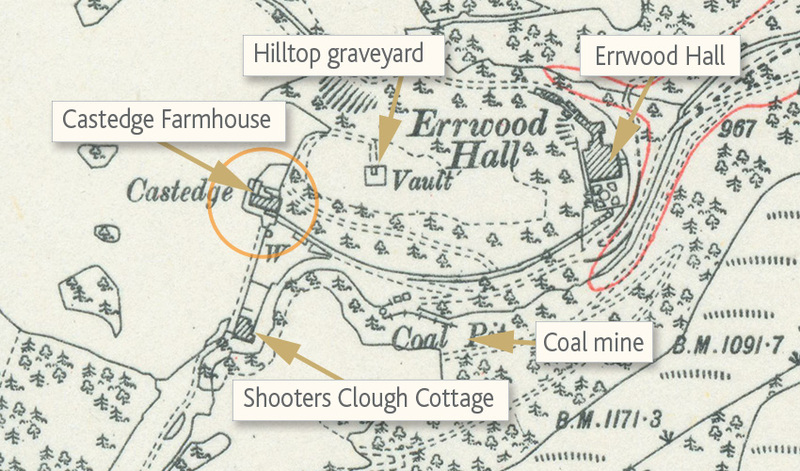 This 1890 map shows Castedge Farmhouse lying below the Grimshawe family’s hill-top mausoleum, and close to Errwood Hall (click to enlarge). I think the other Castage mentioned in the census may be Shooter’s Clough Cottage. In the early 1900s this was home to the mine manager, Jack Hewitt, and his family. Castedge is probably the most visited of the farmhouses that were demolished in the 1930s. But few people realise as they pass by the ruins. Today, it’s just a sad pile of stones at a junction of footpaths (see inset above), below the Grimshawe family’s hill-top graves. But at one time, it was quite a substantial building. The spelling of the name seems to have changed from Castage to Castedge* – which makes the census records slightly confusing (see below). And there’s more than one building listed under the name Castage. There was another cottage close-by which Gerald Hancock in his Goyt Valley Romance identifies as Shooter’s Clough Cottage, and was home to the manager of the nearby coal mine. So I’m guessing this could be the other building. Thomas Braddock is listed as a gamekeeper in the 1881 census. His grave lies in the Grimshawe family’s hill-top cemetery. The stone also includes the name of his daughter, Elizabeth, who died aged just 19 in 1903, which puts the year of her birth at either 1883-4. By the time of the next census in 1891, the Braddock family seems to have moved away from Castedge so she doesn’t appear on these records. *Mike has forwarded me a link to a site listing changes in place-name over the years (click to view). It shows that this location was first mentioned in 1629 as Castid, then Castids in 1665, followed by Castage in 1831. The easiest OS map I’ve seen calling it Castedge is dated 1890.